One of the chief concerns among many people with disabilities is staying in shape. Secondary health conditions are an issue for people with disabilities. If you are a wheelchair user obesity can become an issue due to sedentary lifestyle. It’s a valid concern, but one that can easily be addressed. There are various programs available that will help people who use wheelchairs to stay healthy and physically active. For a great upper body workout, there are a few basic exercises that will work every muscle group. More than that, these are exercises that are comfortable and won’t place unnecessary strain on your body. For most upper body workouts, you’ll need a resistance band, dumbbells, and a medicine ball that weighs anywhere between 2-8 pounds depending on your preference. Your trainer or instructor will be able to help you make this decision. Naturally, it is always best to check with your doctor before you start any sort of workout regimen, and this one is no different. But once you are cleared, try this routine out. Make sure you are sitting straight; rely on your abs to keep a straight posture. Before implementing weights, test out the motions and movements just to make sure you properly get your form down. If any of the movements feels uncomfortable, you may want to remove it from the workout. Never choose a weight that makes you strain. Use a lighter one and work your way up as your muscles develop. This is especially important when it comes to an exercise ball. Using too much weight can hurt your back, making it uncomfortable when pushing a wheelchair. Stay consistent. 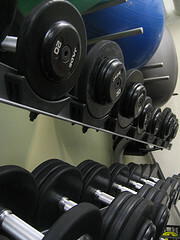 Try to do your workout two or three times a week on non-consecutive days. If you start to tail off and miss a few workouts, you may find yourself getting sore when you try to start back up. Even after a doctor has cleared you, always check with a trainer or a similar professional to make sure you are doing your reps correctly. Keeping good form is vital to working out and you may need someone to look over your shoulder in the beginning. What are some of your favorite upper body exercises that you would recommend? Chris Miller is the director of interactive marketing for The Mobility Resource, an online adaptive driving marketplace. His team helps people with disabilities regain driving freedom through vocational rehab, veteran affairs and several non-profit and private organizations. An avid fitness nut, his exercise philosophy focuses on a complex circuit including CrossFit, yoga, calisthenics, bodybuilding fundamentals and all-natural nutrition. He’s worked with the Cleveland Wheelchair Cavaliers, Reebok, ESPN and the CrossFit Games. In his free time, Chris enjoys spending time with his daughter while they dish up amazing meals for friends and family. A graduate of The University of Akron, he holds a B.A. in public relations. Follow him on twitter @SweetMobility. Also, find him at http://www.themobilityresource.com/.